PKR has slammed the Election Commission (EC) for going ahead with the publication of the second notice to publicise its revised recommendations over the redrawing of electoral boundaries in Sarawak. Describing the EC's move as "being disrespectful of the rule of law and the judiciary", Sarawak PKR vice-chairman See Chee How said the EC should withdraw the second notice and put the review process on hold pending a decision from the Kuching High Court over the party's application for judicial review to challenge an earlier notice. The court is scheduled to deliver its decision on either May 15 or May 25. See and a voter from Ulu Baram, Pauls Baya, had filed an application for leave for a judicial review on the boundary redrawing exercise on February 2 and were granted leave by the High Court on February 17. Both of them in their affidavit said the publication, or notification, of the EC to review the delineation was not in compliance with the provisions contained in the 13th Schedule of the Federal Constitution and are seeking court orders to declare the exercise "null and void and of no effect". See had argued that the EC failed to publish the January 5 notice in a newspaper that was widely circulated in the constituencies affected. “It is (therefore) illogical for the EC to issue the second notice… (as) parties are now in the process of preparing and submitting their legal arguments to the High Court. “We do not want to speculate on the outcome of the court’s decision, but it is prudent and reasonable for the EC to temporarily put on hold the second notice and subsequent boundary review proceedings pending the outcome of the court’s decision,” See said in response to the publication of the notice in The Borneo Post. See, the assemblyman for the Kuching urban seat of Batu Lintang, said the EC should be reminded of the court’s decision in granting leave for the judicial review, that their notices and their decisions, actions or omissions are questionable by judicial review. “In the event that the first notice is adjudged to be wrongful and void, much valuable public funds and human resources expended into the delineation review exercise will be wasted,” he said. “By ignoring the proceedings of the judicial review in the High Court and in persisting to publish the second notice on their revised recommendations for the electoral boundary delineation, the Election Commission is only showing itself to be aloof and pompous,” See added. Sarawak DAP on the other hand announced on March 9 that it would also take the polls watchdogs to court for refusing to grant a public hearing on two objections it had filed over the redrawing of Bandar Kuching parliamentary constituency's border. Its state chairman Chong Chieng Jen said apart from applying for leave for a judicial review, DAP would also apply for a stay of the entire redelineation process. The EC raised DAP's ire for refusing to hear its objection to the increase of nearly 28,000 voters into the Bandar Kuching constituency with the shifting of the PKR-held state constituency of Batu Lintang into it. Prior to the delineation, the Chinese-majority seat of which Chong is elected representative was made up of Pending and Padungan, and Batu Lintang was formerly under another DAP-held seat, Stampin. The “new” voters from Batu Lintang would push the total number of voters in Bandar Kuching to nearly 80,000. – March 31, 2015. The Edge publisher Ho Kay Tat and The Malaysian Insider (TMI) chief executive Jahabar Sadiq were arrested this morning when they turned up at the Dang Wangi police station for questioning. The arrest of the duo came hot in the heels of the arrest of three senior TMI editors - Lionel Morais, Amin Shah Iskandar and Zulkifli Sulong - over a report on the Conference of Rulers published by the news portal which is said to be erroneous. Late yesterday afternoon a team of police and Malaysian Communications and Multimedia Commission (MCMC) officials raided the TMI office and seized a number of laptops. According to TMI, the police will be applying for a remand order for five editors later today. "These arrests appear to go beyond just our reportage about one hudud article," Jahabar told TMI before he was arrested. "The Malaysian Insider will continue to report without fear or favour despite these arrests. It is business as usual." The Edge is owner of the TMI news portal. The five are investigated under Section 4 of the Sedition Act for publishing seditious material and Section 233 of the Communication and Multimedia Act 1998. If found guilty, they can be fined up to RM5,000 and jailed up to three years or both. Under Section 233 of the Communications and Multimedia Act, they can be fined up to RM50,000, jailed up to a year or both. More than 100 politicians and civil society activists have been arrested in this month alone. KUCHING: PKR Sarawak has resolved to write to Chief Minister Datuk Patinggi Tan Sri Adenan Satem to propose the tabling of a joint motion during the coming State Legislative Assembly (DUN) sitting to declare that hudud will not be implemented in Sarawak. Its chairman Baru Bian said the letter would be sent to the chief minister by today and hoped that the elected representatives from both sides of the political divide would agree to the motion, considering the alarm the issue has caused among Sarawakians. He said in the event the chief minister “is not minded” to table the non-partisan motion on behalf of the House, PKR state assembly representatives will cause the motion to be tabled for deliberation and adoption by the state legislative body. Baru, who is Ba Kelalan assemblyman, said a special meeting of the PKR Sarawak State Leadership Council was called on Tuesday, which was attended by 25 out of 29 leaders including five Muslim leaders, to discuss the attempt by PAS to push for hudud in Kelantan. “It was unanimously resolved that PKR Sarawak repeats and reiterates our firm stand against the attempt by PAS to amend the Federal Constitution for the implementation of hudud. “We would like to reassure Sarawakians, that in matters affecting Sarawak and our people, we are ‘Sarawakians First’,” he told a press conference at the state PKR headquarters here yesterday. Baru said PKR Sarawak recognised that hudud is part and parcel of the Syariah, which is found in the Koran. However, PKR Sarawak stands firmly against the implementation of hudud in Malaysia and Sarawak for the reason that the Federal Constitution and not the Syariah is the supreme law of the Federation, he affirmed. In addition, Baru said the Rukunegara, which sets out the fundamental principles of governance directed towards the creation of a just and democratic society, reinforced the supremacy of our Federal Constitution through these tenets: ‘Upholding the Constitution’ and ‘Rule of Law’. He said during the talks leading to the formation of Malaysia, the non-Muslim communities of Sarawak had voiced their reservations about Islam being the religion of the Federation, adding that the absence of a state religion was key to Sarawak’s agreement to join in the formation of Malaysia in 1963. “Furthermore, there is enough evidence in our historical documents and legal judgments to establish that Sarawak had signed the Malaysia Agreement with a secular state. The implementation of hudud requires the amendment of the Federal Constitution, particularly Article 4. In this regard, Baru said Point 16 of the 18/20-Point Agreement should be highlighted, such as the power to amend the Sarawak Constitution or the Federal Constitution insofar as the changes affect the rights of Sarawak belongs exclusively to the people of Sarawak. Baru pointed out that these safeguards were promulgated to ensure that Sarawakians’ rights cannot be taken away from them without their consent. Among those present at the press conference were PKR Sarawak deputy chairman Abang Zulkifli Abang Engkeh, vice-chairmen See Chee How, Ali Biju and Boniface Willy Tumek. KUCHING: Ba Kelalan assemblyman Baru Bian has requested Majlis Amanah Rakyat (Mara) to reply to his letter enquiring whether it had withdrawn the rule that restricts non-Muslim religious activities in all junior science college (MRSM) in the state. “I cannot access their (Mara) Internet website (to check whether the rule has been withdrawn). It could either mean they have withdrawn the rule or they are trying to hide something. “I don’t want to make a conclusion, not until there is a black and white reply from Mara. We want to clear this out, and they must be transparent because it had invoked a lot of apprehensions among many parents,” Baru told a press conference at state PKR headquarters here yesterday. In his letter to Abdul Wahid Ahmad – the director of secondary education at Mara’s head office in Kuala Lumpur, Baru requested Mara to explain if the “additional rules” for non-Muslims students existed. Baru, who is also state PKR chairman, said it was important to find out the truth as he had earlier said he planned to take legal action against Mara if the rules were not withdrawn. 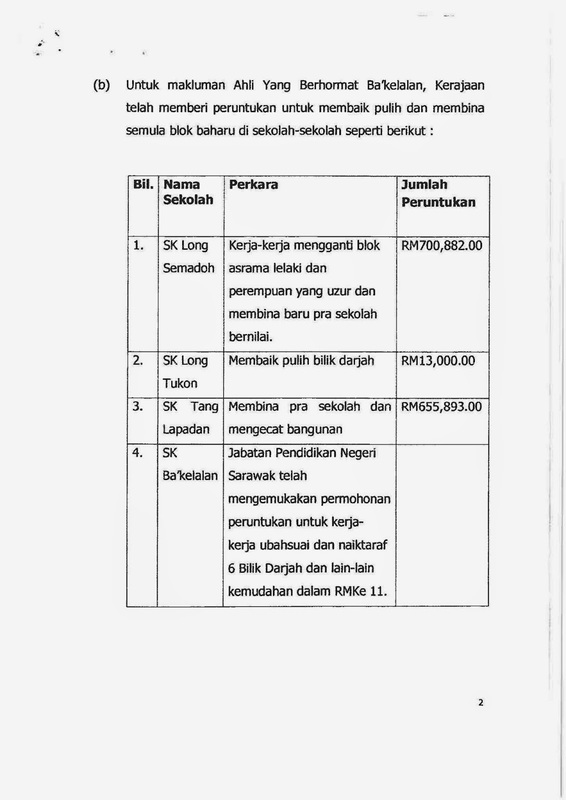 The issue is Rule 9 in the MRSM guide book for new students. It stated that all religious activities, with the exception of Islamic religious activities, are totally prohibited within the campus. The rule prohibited the display of religious symbols like crucifix necklace, and students are required to seek permission to attend religious activities outside the campus. Recently, Deputy Prime Minister Tan Sri Muhyiddin Yassin directed Mara to revoke with immediate effect all regulations banning non-Muslims religious activities within MRSM campuses in Sarawak. The ban was not only opposed by Chief Minister Datuk Patinggi Tan Sri Adenan Satem but Dayak leaders across the political spectrum. It was reported that Adenan summoned Minister of Rural and Regional Development Datuk Seri Shafie Apdal, whose ministry has jurisdiction over Mara, to Kuching to discuss the issue. While Shafie denied there were religious curbs in Sarawak MRSMs, he told a press conference after meeting Adenan that if there were such regulations, “it is not right” and Mara would withdraw them. A few days later, however, the minister was quoted by national news agency Bernama as saying that “MRSM had never imposed any additional rules that prevented students from following or practising their own religion”. DAP vice chairman Leon Jimat Donald raised the issue when he voiced the concerns of some Dayak parents who had children studying in MRSM Betong last October. KUCHING: Sarawak PKR chairman Baru Bian believed many Sarawakians would like to see a strong and united Pakatan Rakyat (PR) in the state. This was despite state DAP considering quitting from the pact following PAS’ decision to table hudud law in Kelantan. “As far as Sarawak PKR is concerned, we would like to preserve that unity,” he told a press conference at state PKR headquarters here yesterday. Baru, who is also Ba Kelalan assemblyman and a lawyer, said this when was asked to comment on state DAP chairman Chong Chieng Jen’s recent statement that he (Chong) could see no other option but the breakup of PR Sarawak following the tabling of the hudud law by PAS. “In light of the ‘back-stabbing’ by PAS in the tabling of the hudud Bill in Kelantan, it is now either PAS or DAP in Pakatan Rakyat Sarawak. “Given the said betrayal, DAP Sarawak will have no choice but to consider taking the final step to leave Pakatan Rakyat,” said Chong, who is also Bandar Kuching MP and Kota Sentosa assemblyman. It is understood that the state DAP leadership would announce its decision whether to leave PR Sarawak this Friday. Baru said considering that the state DAP would only decide on the matter on Friday, he would wait until then before responding accordingly. A special meeting of the PKR Sarawak State Leadership Council was called last night to discuss the attempt by PAS to push for hudud in Kelantan. It was unanimously resolved that PKR Sarawak repeats and reiterates our firm stand against the attempt by PAS to amend the Federal Constitution for the implementation of hudud. We would like to reassure all Sarawakians, that in matters affecting Sarawak and our people, we are ‘Sarawakians First’. On this premise, and acknowledging the alarm with which Sarawakians view the issue of hudud, PKR Sarawak has resolved to write to the Right Honourable Chief Minister to propose the tabling of a joint motion in the coming Sarawak State Assembly sitting to declare that hudud will not be implemented in Sarawak. In the event the CM is not minded to table the nonpartisan motion on behalf of the House, our PKR State Assembly representatives will cause the motion to be tabled for the deliberation and adoption of the state legislative body. At the outset, we recognize that hudud is part and parcel of the Syariah, which is found in the Koran. However, PKR Sarawak stands firmly against the implementation of hudud in Malaysia and Sarawak for the reasons that follow. Principally, we turn to the Federal Constitution, the document upon which the Federation of Malaysia is founded, to support our assertion. Article 4 of the Constitution declares: “This Constitution is the supreme law of the Federation…”. As explained by Raja Azlan Shah in 2003: “This essential feature of the Federal Constitution ensures that the social contract between the various races of our country embodied in the independence Constitution of 1957 is safeguarded and forever enures to the Malaysian people as a whole, for their benefit.” Therefore, the Federal Constitution - and not the Syariah - is the supreme law of the Federation. In addition, our Rukunegara, which sets out the fundamental principles of governance directed towards the creation of a just and democratic society, declares these tenets: ‘Upholding the Constitution’ and ‘Rule of Law’. These tenets reinforce the supremacy of our Federal Constitution. During the talks leading to the formation of Malaysia, the non-Muslim communities of Sarawak had voiced their reservations about Islam being the religion of the Federation. It was finally agreed as the first of the 18/20-Point Agreement that ‘While there was no objection to Islam being the national religion of Malaysia, there should be no State religion in Sarawak, and the provisions relating to Islam in the present Constitution of Malaya should not apply to Sarawak’. The absence of a state religion was key in Sarawak’s agreement to join in the formation Malaysia in 1963. Furthermore, there is enough evidence in our historical documents and legal judgments to establish that Sarawak had signed the Malaysia Agreement with a secular state. The founding father, ‘Bapa Malaysia’ Tunku Abdul Rahman stated it plainly in Parliament: ‘I would like to make it clear that this country is not an Islamic State as it is generally understood, we merely provided that Islam shall be the official religion of the State’ [Hansard, 1 May 1958]. The implementation of Hudud requires the amendment of the Federal Constitution, particularly Article 4. In this regard, Point 16 of the 18/20-Point Agreement should be highlighted: that no amendment, modification or withdrawal of any special safeguard granted to Borneo (Sabah and Sarawak) should be made by the Central Government without the positive concurrence of the Government of the state of North Borneo/Sarawak. Therefore, the power to amend the Sarawak Constitution or the Federal Constitution insofar as the changes affect the rights of Sarawak belongs exclusively to the people of Sarawak. This protection is reinforced in Article 161E of the Federal Constitution, which provides safeguards for the constitutional position of Sabah and Sarawak, whereby no amendment of the Constitution can be made without the concurrence of the Governor if it is to affect the constitution and jurisdiction of the High Court in Sabah and Sarawak, and the religion in the State. These safeguards were promulgated to ensure that our rights cannot be taken from us without our consent. With such hurdles to clear, it is obvious that the framers of the Sarawak and Federal Constitutions had every intention of preserving Sarawak’s autonomy and our freedom of religion. Hudud has no place in Malaysia, most especially in Sarawak.